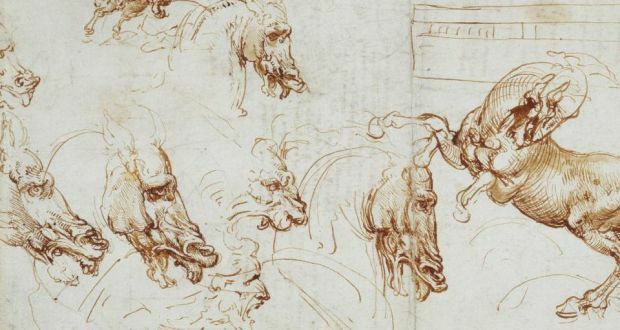 Following the exhibitions at these venues, in May 2019 the drawings will be brought together to form part of an exhibition of over 200 sheets at The Queen's Gallery, Buckingham Palace, the largest exhibition of Leonardo's work in over 65 years. A selection of 80 drawings will then travel to The Queen's Gallery, Palace of Holyroodhouse in November 2019, the largest group of Leonardo's works ever shown in Scotland. Leonardo used ink made from oak galls and iron salts, which is transparent in infrared light, allowing his black chalk underdrawing to be seen for the first time. Examination of A Deluge, c.1517–18 (to be shown at the National Museum Cardiff) revealed that beneath the pattern-like arrangement of rain and waves in brown ink, Leonardo drew a swirling knot of energy in black chalk at the heart of the composition. Similarly, in Studies of water, c.1517–18 (to be shown at the Millennium Gallery, Sheffield) he built up the image in stages, first creating an underlying structure of water currents in chalk and then adding little rosettes of bubbles on the surface in ink, almost as decoration. All the drawings by Leonardo in the Royal Collection were bound into a single album by the sculptor Pompeo Leoni in Milan around 1590 and entered the Collection during the reign of Charles II. What appear to be two completely blank sheets of paper from this album will be on public display for the first time at The Queen's Gallery, Buckingham Palace. Examination in ultraviolet light has revealed these sheets to be Studies of hands for the Adoration of the Magi, c.1481 and among Leonardo's most beautiful drawings. Watch a clip from the recent Royal Collection Season on the BBC showing the sketches appearing under ultraviolet light. 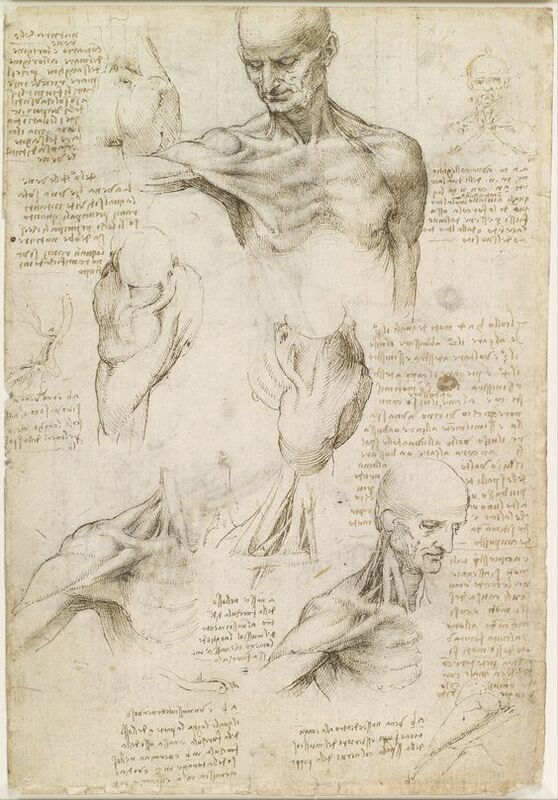 Leonardo executed the studies of hands in metalpoint, which involves drawing with a metal stylus on prepared paper. One of the sheets was examined at the UK's national synchrotron, the Diamond Light Source at Harwell, Oxfordshire, using high-energy X-ray fluorescence to map the distribution of chemical elements on the paper. It was discovered that the drawings had become invisible to the naked eye because of the high copper content in the stylus that Leonardo used – the metallic copper had reacted over time to a become a transparent copper salt. By contrast, A design for the Sforza monument, c.1485–8 (to be shown at Leeds Art Gallery), which is drawn with a silver stylus, is still fully visible.